How do I know if my air conditioning (A/C) is bad? If your air conditioning is blowing warm air instead of cold, or the system makes unusual noises when it’s engaged, something is amiss. How often should I recharge my air conditioning? You should recharge only if you or your mechanic find a leak. As long as your air conditioning is blowing cold air, there’s no need to recharge or “top off” the system with refrigerant. 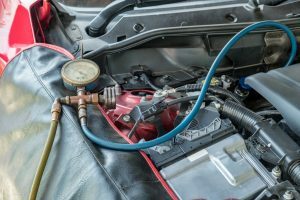 Since refrigerant circulates in a closed system, it isn’t burned up like gasoline. Who do I have to check my air conditioning? Air conditioning should be checked because problems won’t fix themselves. Refrigerant could be leaking, the compressor could be failing or the condenser, evaporator or another component might be corroded. Adding refrigerant may provide a temporary fix. Eventually the air conditioning won’t work. A mechanic should inspect the entire system and fix the cause. A non-functioning A/C isn’t only about comfort; the air conditioner also dehumidifies the air to defrost and defog windows so you can see where you’re going, even if it’s cold outside.